Posted February 1, 2018 by Jamie Apps & filed under Arts & Entertainment, Events. Blak Markets are an organisation which aims to expand the opportunities for Indigenous people and sell Indigenous product the whole year round in their online store. The foundations of the company though are in Sunday markets, which run on the first Sunday of every month. 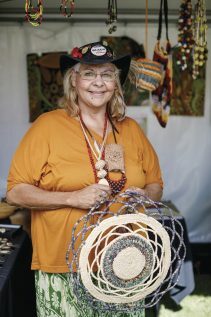 Join Aboriginal and Torres Strait Islander artisans at the iconic Blak Markets at Bare Island this weekend from 9:30am until 3pm.From original and affordable aboriginal artworks to handmade beauty products, handicrafts to one-of-a-kind homewares and jewellery, there are authentic gifts for all ages made by Indigenous artisans. Entertainment for the day includes performances by the Illawarra Flames dance group and Triple J Unearthed Indigenous Award winner singer-songwriter Rebecca Hatch and a kids performances by the Didja Didge characters. There will also be free weaving workshops with Karleen Green weaving a whale from recyclable materials. By buying from Blak Markets you can not only guarantee authenticity but also that 100% of the profit go towards social change in Aboriginal communities across Australia.